George W. Carver, the great scientist, developed hundreds of uses for peanuts, and among them were 105 recipes for peanuts consumption. The document, where all recipes were printed, included three recipes for peanut cookies. They called for cookie dough with chopped or crushed peanuts. But it took some time before peanut cookies evolved to peanut butter cookies. 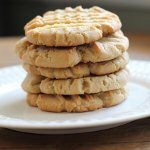 The first peanut butter cookies recipe was printed in 1932 by the Schenectady Gazette, but the recipe is likely existed before that. The printed recipe called for the dough to be thinly rolled and cut into shapes or small pieces dropped and then made into balls with a crisscrossed fork marks on the top. Even today peanut butter cookies are made with this iconic pattern! Find your grandma's recipe of peanut butter cookies and bake them to celebrate today's holiday. Share you cookies with friends and family. Happy National Peanut Butter Cookie Day!